Insert frequently-typed phrases into your Outlook 2003 - 2010 messages in a click. See all your templates at a glance organized in a multi-level tree structure and easily find the needed one with quick search. Use various macros, assign shortcuts to most often used templates or add them to Favorites. Have a certain template automatically inserted into all new emails, replies or forwards. Share your templates with co-workers on a network drive. Insert frequently-typed phrases or templates into e-mail messages in a click. ...... or Subject fields, to request Read or Delivery receipts etc. - Shared templates option. You can save your templates somewhere on a network server and let your colleagues use them. - Quick search in all templates. You simply switch to the Search tab and type the keywords. As you type, all templates containing this word, or its part, appear in the Template Phrases pane. - Favorites. This tab lets you arrange the most frequently used templates so that you can pick the needed one in an instant. - Shortcuts. Assign shortcuts to most often used templates or have a certain template automatically inserted into all new emails, replies or forwards. - Recently used tab lets you see the most recently used templates at a glance. - Export / import features allow you to access your templates on several PCs. 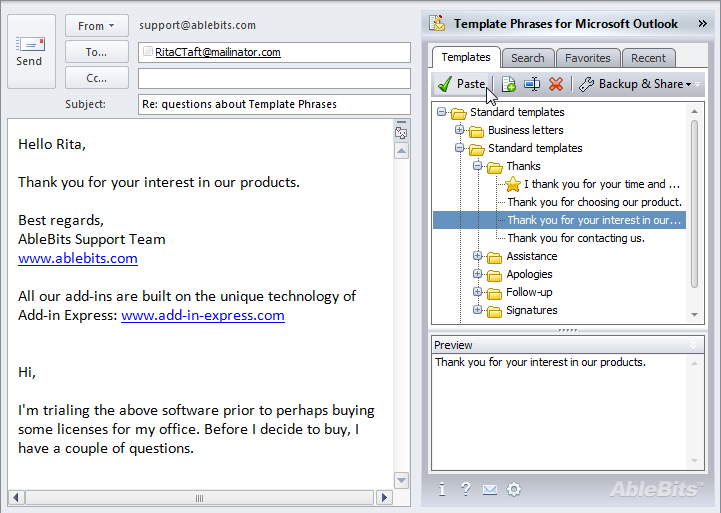 Reply or forward e-mail with the predefined Microsoft Outlook templates. DB for Outlook provides Microsoft Excel and Microsoft Outlook users. Add-in helps you with entering frequently repeated text fragments. Have BCC/CC copies created automatically. For Outlook 2007, 2003, XP, 2000. TemplateTamer is a php template oriented web application development tool. Share Outlook calendar and contacts - affordable Exchange Server alternative. Qweas is providing links to Template Phrases for Microsoft Outlook 2.2 as a courtesy, and makes no representations regarding Template Phrases for Microsoft Outlook or any other applications or any information related thereto. Any questions, complaints or claims regarding this application Template Phrases for Microsoft Outlook 2.2 must be directed to the appropriate software vendor. You may click the publisher link of Template Phrases for Microsoft Outlook on the top of this page to get more details about the vendor.